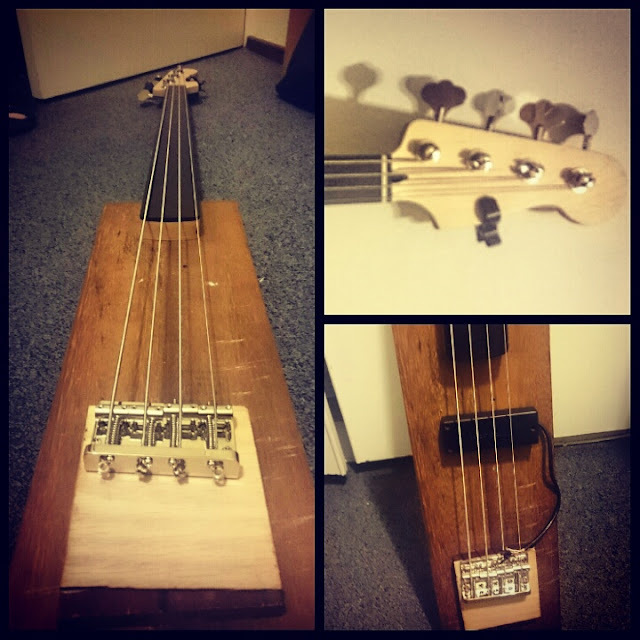 I had a minor attack of gas, went looking for a fretless (not that I could play it) this week. Did some reading on ebonol fretboards and concluded a mighty mite neck w/ebonol as a home build would be the way forward (Or a SX Ursa if I could find one). And here you're building one - awesome! The oregon pine is going to result in a weighty beast though? I had a tele (body from reclaimed roof timber), it was seriously heavy. Looks beautiful. But I love wood. Who else has spotted the trend that guitars attract paint to cover up the wood, but bass players are often more inclined to show off the beauty? I had a Cort Curbow 5 fretted with an Ebonol board and it was fantastic- flat, strong, stable. Because it is a composite, it does have a subtle 'grain' that comes out a little with wear. I'm pretty happy with it as a fingerboard material. V8 wrote: The oregon pine is going to result in a weighty beast though? I had a tele (body from reclaimed roof timber), it was seriously heavy. Might be. I'll have to see once I start buying timber. If needs be, I'm hoping I can route some weight relief. Wizard wrote: Who else has spotted the trend that guitars attract paint to cover up the wood, but bass players are often more inclined to show off the beauty? I think for bass players this started with Alembic's work in the 60s. A lot of influential players used them, then other luthiers like Ken Smith, Spector, Fodera and eventually Ibanez started copying that look. The hardware arrived acouple of weeks ago, so I have all the parts I need except the bit of wood that holds them all together. Will go trawling some salvage yards over the next few weekends to find something I like the look of. I decided I wanted a scratchplate, sketched something based on the Fender Roscoe Beck scratchplate, itself inspried by 70s Fender thinline guards. So I spent a bit of time over the weekend setting up a 'test mule' (like the ones Leo Fender used) to help me finalise the pickup position. 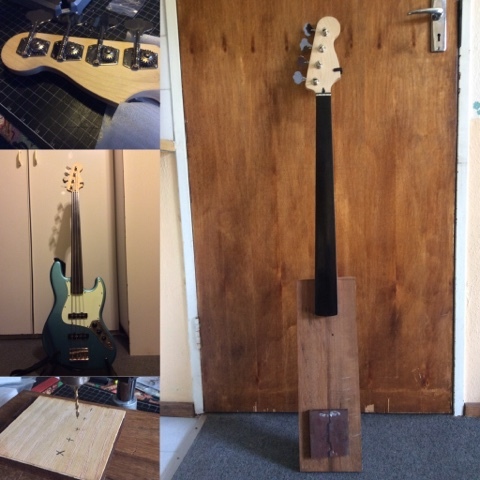 First step was to mount the tuners and drill the neck for mounting. 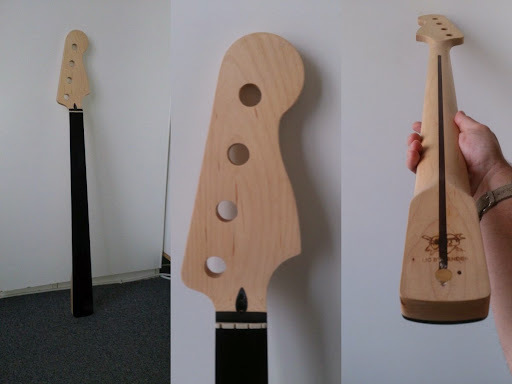 I used the best template I had- the neck pocket of my J bass. While I was checking the fit, I took the opportunity to string it up and test out the neck on the Jazz body. After that, I mounted the bridge (badly- the neck was skew so I adjusted the bridge to match) and, after picking up some mounting screws this afternoon, I'm ready to start experimenting with the placement of the pickup for the tone I'm after. Excuse the noob questions - I'm curious! So when choosing pup placement, what are you looking for? Is it mostly pup placement (regardless of pup type) - E.g. closer to bridge = more finger attack (I'm thinking rickenbacker/rock), more in the middle = P-bass mids and more to the neck = jazz-y warmth? Or is it more dependent on pup type, E.g. depending on the type of pup, you'll adjust to balance out the inherent tone of the pup with the placement. E.g. Humbucker more to the bridge to add a bit of treble to the warmth of the bucker? Meron Rigas wrote: Excuse the noob questions - I'm curious! It's mostly to answer this question that I'm giving it a try. Apparently the position and construction both have a lot to do with tone- some people say that a MM pup in the P-bass position sounds more like a precision than a Stingray. I'm going to move it around and see. One of the things is that an active circuit can compensate for the loss of warmth you get when moving closer to the bridge- apparently the Stingray circuit was tweaked with the position of the pickup in mind, to compensate for the shortcomings of the tone. peterleroux wrote: It's mostly to answer this question that I'm giving it a try. Aha, makes for a interesting experiment! You said "MM" pup, that's a mighty mite pup? It also crossed my mind that the active circuit could mask some of the tonal changes one would get from moving the pup around. Keep us updated please - quite curious! I've got a old Hofner (missing the original pup) that I need to drop another pup into (Probably a P Bass passive, if I can find a reasonable one). 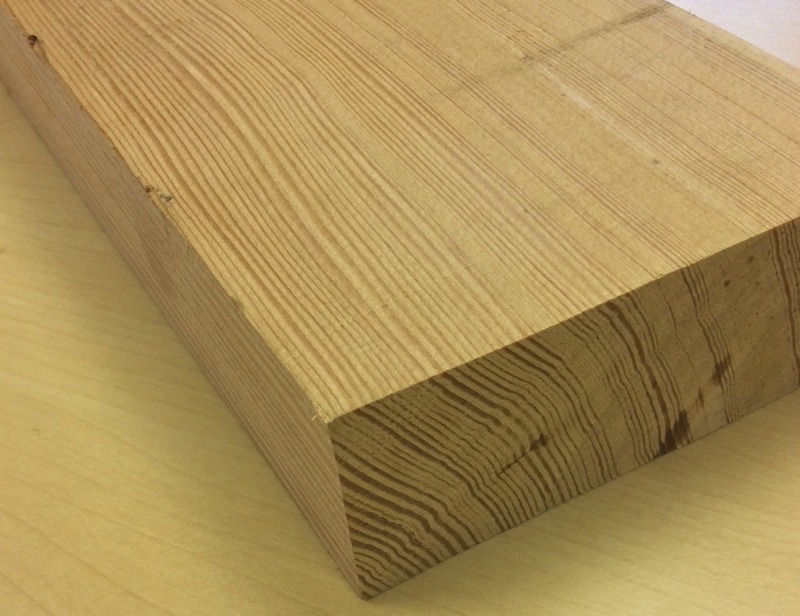 I've just picked up a piece of Oregon Pine at Country Woods, so I hope to be routing the body in the next few weeks. About R300 and I'll have about 300mm left over on the plank when I'm done. Very fine grained for Oregon. This thread has come in useful along with this one on talk bass : (https://www.talkbass.com/threads/dr-dimentos-ongoing-p-pup-experiment.127322/page-4 to help me contemplate if the Pbass pup in the hofner is kinda the ballpark for a pbass. It's roughly in between the placement of a pbass and a p/j bass - which I'm happy to leave as is. Interesting Dr Dimentos comes to the same basic conclusion : closer to warm = warmer, closer to bridge = brighter/clearer. Did you get around to the 'bronco' experiment?. There's one hanging around the gear junkie - the pup sounds pretty good to my lofi ears. 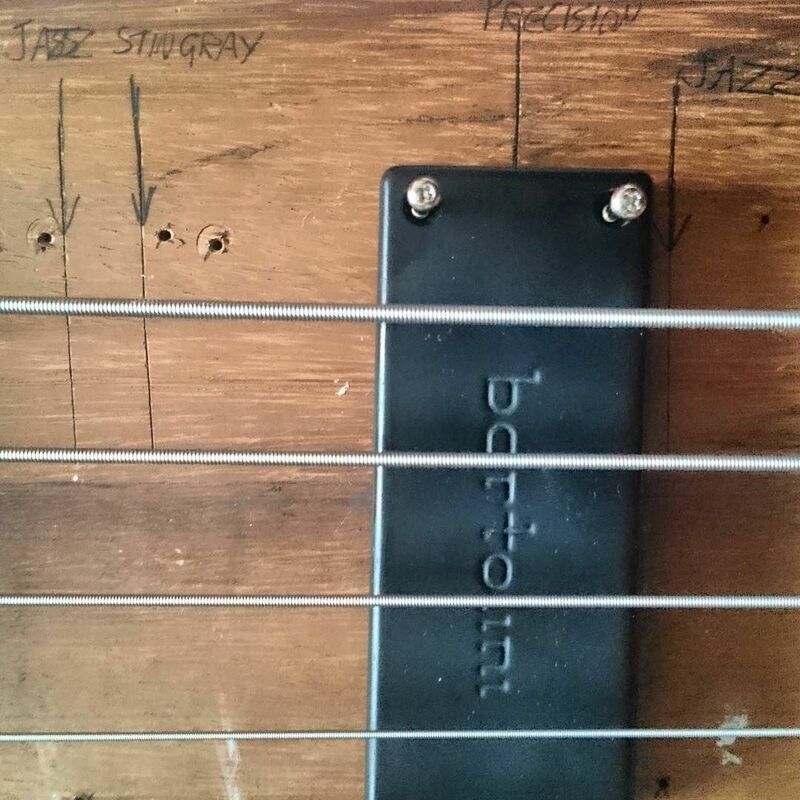 There's a thuddyness to the E string, while the rest sound fairly bright. It kinda reminds me of a vintage pbass in a way? So I sent drawings off this afternoon to a laser cutting fabricator to do this..
am I'm reading correctly? you are going Supawood? why lasercut, and not CNC routed? tedibear yes, humble MDF. And I’m going with laser cutting because this guy has been responsive and has good pricing- i approached a few guys over the last 3 years about CNC milling but for various reasons they never came back with anything. 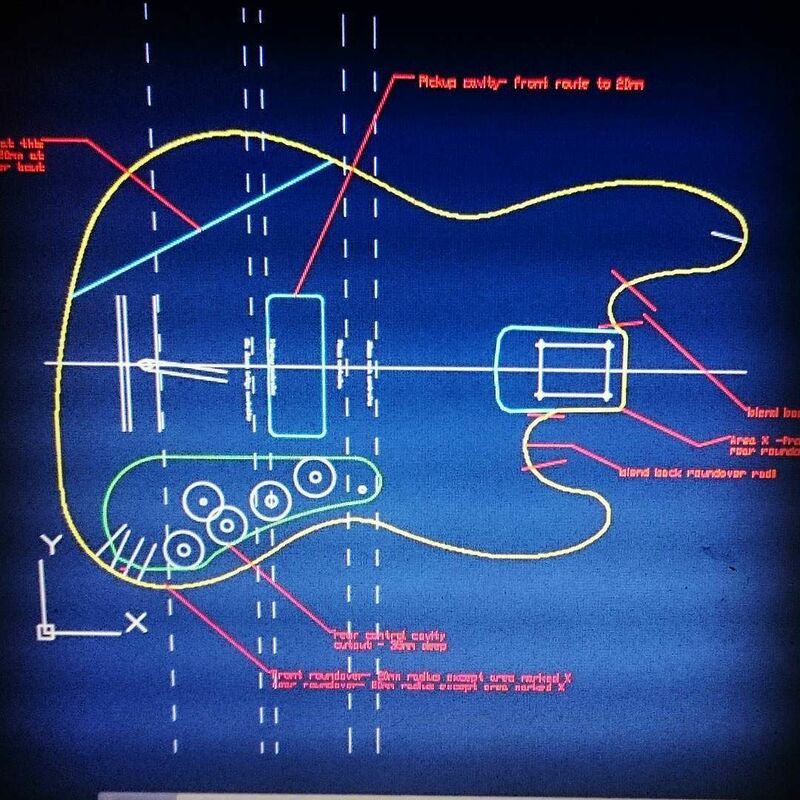 Haha ok.. was wondering why you wanted to smoke out a factory..
Fender designs been a bolt on.. as long as you keep the brigde position relative to the neck pocket.. you could make any design..
MMMMM fretlest Flaming flying V with F-holes. thanks, that's an interesting offer. Where are you based? I'd much rather have something in real wood.